The villas of Half Moon Bay, a luxury development of villas on the island of St. Kitts deeded free standing single-family homes. The complex is managed collectively by a neighborhood association. The villas of Half Moon Bay are located on a magnificent hillside site that overlooks the Royal St. Kitts Golf Course and the Atlantic Ocean. 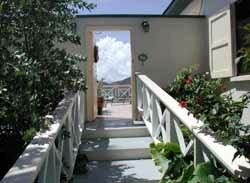 This breeze swept hillside offers views of the ocean, the Southeast peninsula and the Caribbean Sea. Half Moon Bay Villas are unique in that no two villas are identical because of the topography of the hillside. Each villa is custom designed and built on premier development sites with its own magnificent view. Half Moon Bay Villas will appeal to even the most critical real estate eye as a prudent investment.